This sensitivity around data usage for video impacts campaign performance and the effectiveness of one of the most sophisticated tools we have for engaging consumers on mobile devices. 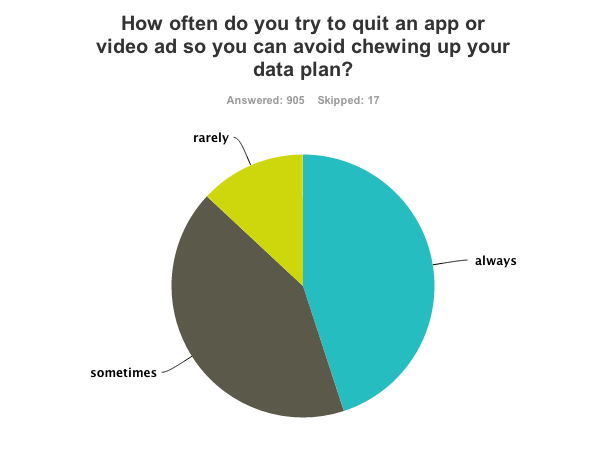 This isn’t to say people don’t want to watch mobile video ads; they simply don’t want to pay the price in data. As the following chart illustrates, if watching a mobile video ad didn’t impact their data plans consumers would be far more willing to engage with the content. This sensitivity is reminiscent of early SMS marketing campaigns, which saw consumers charged for each message they received. Asking consumers to cover the cost of receiving a marketing message can hamper the growth of a promising marketing channel. Mobile video advertising has great potential as time spent on mobile continues to increase. Helping it succeed needs to be a priority for marketers and carriers alike and new programs and approaches are already being deployed. For example, the approach we support enables people to engage with mobile advertising ‘worry free’ by ensuring the mobile cellular data consumed by an advertisement is not charged to the user. AT&T’s innovations in the area of Sponsored Data have enabled Aquto to offer a unique service that enables video content from marketers to be consumed by users without impacting their bill. Advertisers and app publishers like Scharffen Berger (Hershey’s premium chocolate brand) and Zepto Lab (creator of the hit app ‘Cut the Rope) have taken advantage of this capability to allow ‘free’ consumption of their content. For advertisers intent on taking full advantage of the mobile screen, offering an immersive experience while at the same time freeing consumers from the burden of data usage provides an innovative and highly consumer-centric approach. The result is a win-win-win situation: marketers can confidently create and share rich and engaging mobile content; consumers can view content they enjoy without having it count against their mobile data plans and carriers are able to sell more mobile bandwidth. This is the kind of creative solution that will allow mobile to reach its full potential as a marketing channel. Susie Kim Riley is the founder and CEO of Aquto. *Results based on a survey of 1,000 US smartphones conducted by Aquto in November 2013.